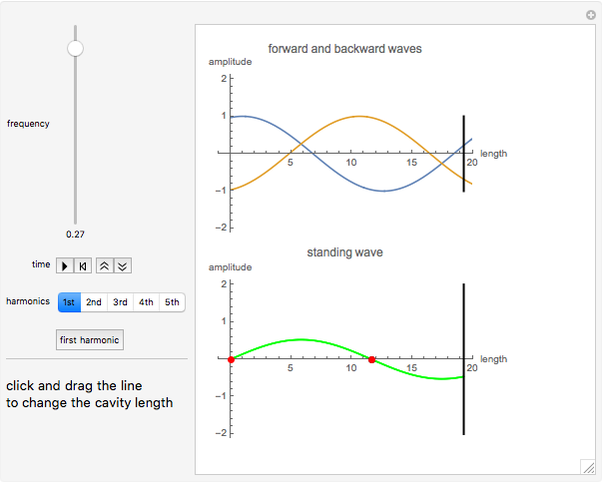 This Demonstration illustrates a concept from classical physics that also applies in quantum mechanics: quantization. This phenomenon takes place when waves on a string with fixed points resonate and, in order to prevent destructive interference, a specific geometrical requirement needs to be met. In this case, an integer multiple of half-wavelength needs to be contained between the fixed ends. Similar principles apply to many musical instruments, for example, guitar strings . 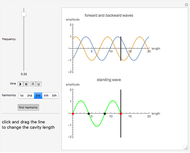 Standing waves are generated by the overlapping of two waves of the same frequency, traveling in opposite directions. The top plot shows the forward wave in blue and the backward wave in amber. Their superposition generates nodes on the longitudinal axis, highlighted in red and black in the bottom plot. As an example, red nodes must match the ends of a guitar string, resulting in the fundamental frequency (first harmonic), without any other black nodes that will show up in the next overtones . 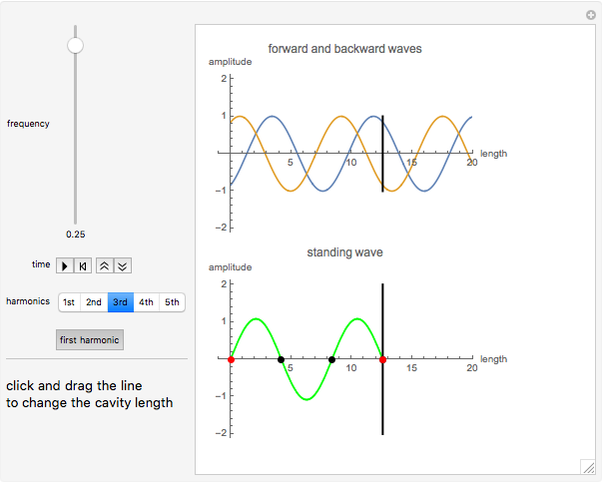 The "frequency" slider determines the frequency of the three waves (forward, backward and standing); the "time" animation control buttons represent time that elapses. The "first harmonic" button is used to automatically locate the second end once the frequency has been set, required to generate a harmonic series, by using the "harmonics" settings to display the different overtones. In addition to the standard controls, it is possible to drag the bar associated with the cavity end using the mouse. G. C. Pimentel and R. D. Spratley, Understanding Chemistry, San Francisco: Holden-Day, 1971. The Physics Classroom. 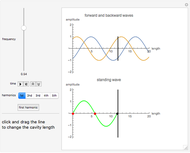 "Formation of Standing Waves." 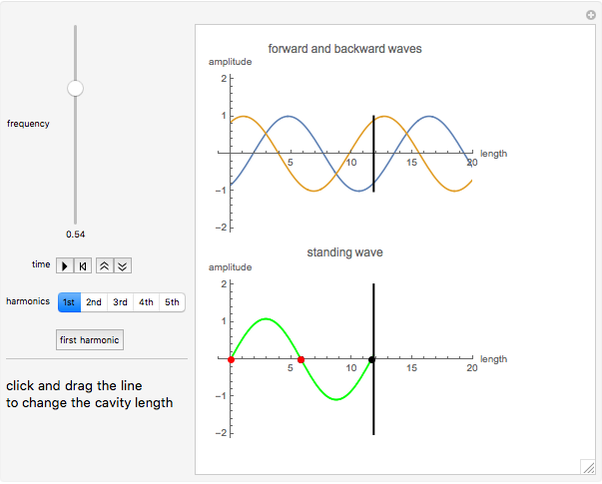 (Sep 13, 2017) www.physicsclassroom.com/class/waves/Lesson-4/Formation-of-Standing-Waves. 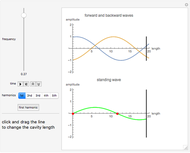 A. Ratti "How to Catch a Standing Wave"